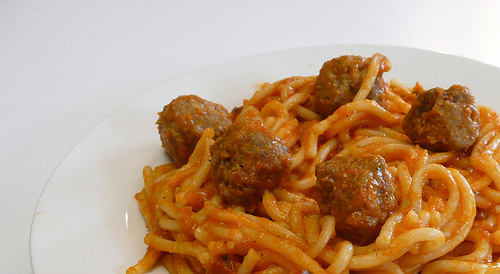 This post is filed under Frozen, Hall of Shame (Taste), Meatballs, Michelina's, Microwave, Pasta, Spaghetti, Tomato Sauce. I’ve been living in Ireland for a couple years and most of the prepared meals here are refrigerated instead of frozen. I must say it makes a world of difference. As for this meal, the pic on the package looks awful. I’m not surprised the meal tastes as good as the pic. No good can come from frozen spaghetti. :[ Sad! I hate to see my favorite pasta dish destroyed by the likes of companies trying to package it frozen. & with the picture of someone’s (Italian?) grandmother on the box! For shame. I’d expect more from Michelina. I must say that this has got to be the largest disparity between looks and taste rating for me…it’s looks down right delicious, sad to hear it hit the rubbish bin. 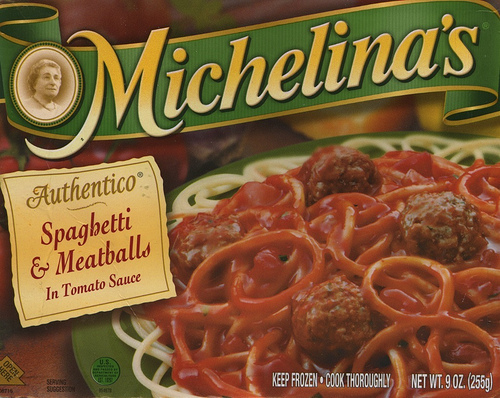 I can’t believe you can talk bout Michelina’s frozen dinners so frequent to her passing in September. By now though I am long over it and agree that the meal is not as fine quality as the companies other frozen products. Man, my grandmother was from Sicily and she made the most delicious meatballs I ever tasted, like you wouldnt believe. Sadly, she died last year and she didnt leave a single recipe for us so I’ve been trying to work it out on my own… slowly working my through the meatball recipes here, I still cant figure out what her secret ingredient was though!! !